Located on one of the highest elevations in the western portion of Ellis County with fantastic 360 degree views from every room in the home. Lovely older ranch style home that has had several nice additions throughout the years to total 4,600 square feet of living area and 2,192 square feet of covered porches, screen porches and decks. In addition, there are two structures with living areas for guests or extended family. The horse barn has 4 stalls with turnouts, concrete alleyway, tack room, hobby room and supply room. And, the second floor of the barn has a wonderful living area. The guests quarters also had a storage room and workshop and a covered parking area. The property is 130.77acres with the home and barns. 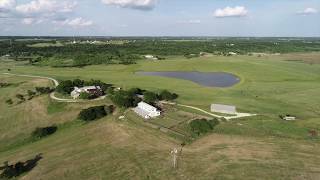 The property has been set up as a cattle ranch with good fencing and cross fencing on the rolling pastures with good water from one 5.4 acre lake and two ponds. There are good holding pens and working pens with squeeze chutes. Easy access to the DFW Metroplex area and Maypearl schools. All minerals owned convey. Be sure and watch the drone video link to get a better ideal of the absolute beauty of the land on MLS or my webpage. the video shows both the property listed for sale and the additional 135.589 acres that is available. From Waxahachie take FM 66 toward Maypearl, turn left on Greathouse Rd. then at the intersection with Old Maypearl Rd. turn right. Property entrance is the first gate on the left on Old Maypearl Rd. Home sits high on the hill. No for sale sign on the property. Gate header says 5L Ranch.